Looking back at 2015 - it was my best soaring year! More flights, hours, distance and speed than ever before, including my longest flight ever (1792km/1113 miles), and what I consider some of my most amazing and unforgettable flights. The map below shows traces from 68 cross country flights in my ASW27, totaling 23,286 miles (37,476km, almost a full circle around the world) and 412 hours, averaging 342 miles (551km) per cross country flight, at an average speed of 58 mph. The flights spanned most of California, Nevada and Utah, from the Pacific to Yellowstone, Wyoming, including Idaho and the Grand Canyon in Arizona. During those trips I visited 20 airports. Had my longest and fastest flight ever: 1792km in a yoyo wave flight from Minden at an average speed of 183 kmh. Had my most amazing soaring flight: From Hollister to Big Sur coast and then across the Central Valley and the Sierra to Minden and Carson City, than back again across the sierras to Stockton. In the process I crossed the whole length of California west to east from the Pacific to Nevada, with a double crossing of the Sierra. 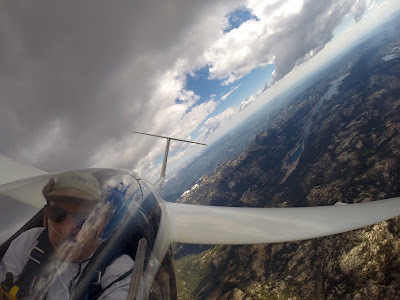 Had an exciting downwind wave/thermals flight from Minden to Arco, Idaho - 465 miles straight out with my wife crewing, which also earned me the Henri Trophy again and the PASCO longest straight distance award. A 525km flight to uncharted territory. Goat to Mendocino coast north of Fort Bragg, then to Napa, Sutter Butte and back to Williams. Very early launch 1 hour after sunrise. My longest and fastest flight ever! 1792km in a 10 hours wave flight from Minden, at an average speed of 183 kmh. Yoyo between Herlong/Pevine to the north and Lone Pine/Mt Whitney to the south - twice! Lift was amazingly strong and so was the rotor. Hit 21 knots climb while flying at speed close to 130 knots near 18,000 feet over the Owens Valley. FAI triangle from Snow Mtn, to Eureka area (20 miles east of Eureka) to Mt Shasta (went around the mountain) and back to Snow Mtn. Just shy of 700km total. 842km - My longest flight from Hollister. Epic day. Went to near San Luis Obispo, Plowshare, McKinley peak (Santa Ynez area), turned south east of Quail over the Mojave desert some 20 miles from Aqua Dulce, then back to Mt Pinos and back to Hollister. The first California/Sierra double crossing, from Hollister to the Pacific to Nevada, and back to Stockton. This exceeded my own expectations, and what I or anyone thought was possible, although I ambitiously suggested pretty much this route in an email to few friends that morning: "How about Big Sur to Truckee and back as far as we can? ", almost making it a declared task. Some background: Ever since Brian crossed the sierras in the middle west to east from Hollister for the first time in 2003 we made numerous unsuccessful attempts. I tried at least 10 times myself. This time I finally made it, and crossed the Sierra both ways over Bear Valley south of Lake Tahoe. To top it I went first to the Big Sur coast, so this flights crossed the whole width of California from the pacific to Nevada. Route was Hollister to Big Sur coast to the Diablo Range, then across the Central Valley to Columbia and across the Sierra to Lake Tahoe and north of Minden and Carson City, then back across the Sierra near Bear Valley and across the Central Valley To Stockton. Not a real landout as I knew that making it back to Hollister is not going to be possible once I committed to my plan. Total distance was 711km. Soaring conditions were epic with climbs to over 12000 feet over the Big Sur coast and over 15,000 feet over the Sierra, yet the climbing along the western Sierra was very challenging getting down to less then 2000 feet AGL near Columbia, and crossing the Sierra relatively low. I consider this my most epic flight this year, if not ever. Something I’ve been dreaming to do for more than 10 years and will cherish forever. This flight would have not happened without Dr Jack blipmap forecast which clearly predicted it was doable. Many thanks to HSC and Jonathan Hughes for towing and to my wife Katia for crewing. The good folks at Inyokern invited us to a BBQ, so David and I flew from Truckee to Inyokern on Saturday (883km via Mt Whitney and the Death Valley), and back to Truckee on Sunday (848km via Tonopah, Austin and Mina since it was too good to just go straight back), without a crew following. I consider straight outs and safaris the ultimate cross country adventures, as you often land in another state, or even in another time zone. You get to fully appreciate the trip when you land in different place very far from home. Similarly to driving a car without stopping, If you never get out of the car and spend some time somewhere, it does not feel like you really traveled. This is also why I like to fly in different places and different routes, I never get bored. Of course it is very helpful to have a loyal crew to follow you, and I thank my lovely wife Katia and my son Nathan for crewing. I could not do it without their help and cooperation. We always spend non flying days visiting places to make the trip worthwhile for the whole family. This year was no exception. We had a most exciting trip across the West in the early summer. Started with a straight out from Minden to Arco, Idaho (500 miles/800km total) to attend the King Mountain Safari. First half on downwind wave flight until North East of Winnemucca, second half in wave induced choppy thermals under mostly overcast sky. This was my first time successfully crossing the snake river , and had surprisingly decent lift over Twin Falls under the overcast. Nearly landed in a field near Craters of the Moon, and had to ridge soar a small hill for a while to get high enough to barely make it to Arco. Soon after landing at Arco John Kangas came to tow me, resulting in a bonus 250km flight entirely in strong ridge lift without a single circle from release at around 7500 feet (1500 feet AGL) to 15,500 feet ridge soaring the whole length of the Lost River mountain range and back to land at the King Mountain Flight Park, where my loyal crew arrived after 10 hours driving. 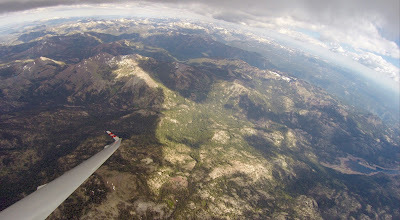 This was followed by several days of great scenic long flights from King Mountain, flying over central Idaho, Montana and Wyoming, as well as Yellowstone National Park (Old Faithful) and the Sawtooth mountains. After having great time at King Mountain it was time to continue to the next destination - Nephi, Utah, to participate in the Nephi OLC camp. Once again the plan was for me to fly straight out to Nephi, with my wife and son following with the car and trailer. I was expecting a great day and easy flight, turned out to be one of my toughest flights. 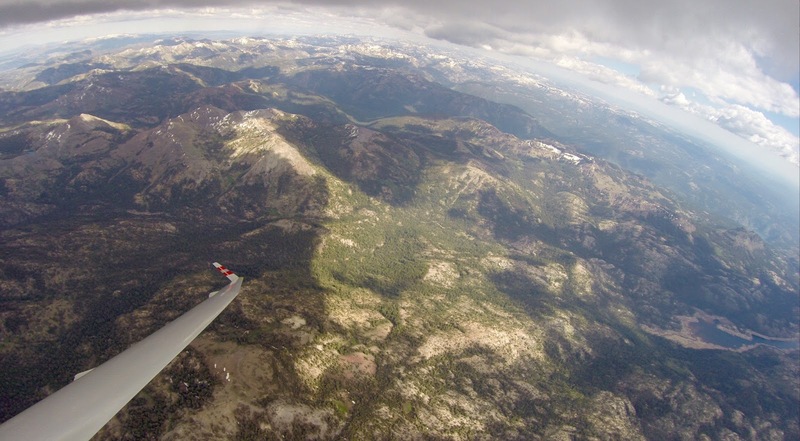 Almost landed in fields twice, with a true nail biting final glide, which required ridge soaring a little hill for a while until I had Nephi in glide. Made numerous mistakes during the flight which made it more difficult than needed. Lots of overcast near King and lots of big blue holes to cross over unfamiliar territory. Flew from King Mountain to Idaho Falls, then to Alpine near Jackson/Tetons area, and from there to Heber and Nephi, a total of 570km. Following the Nephi Camp where I shared the sky with some 60 gliders, I continued to Parowan where I was the only one flying... After few rainy days I had few decent flights from Parowan, including a great sightseeing flight to Zion Canyon and Grand Canyon West. Crossed the Canyon to the Grand Canyon Skywalk and spent some time touring the west part of the Grand canyon. A declared 1000km FAI triangle, which concluded my 2015 summer soaring safari. Overall flew over 8000 miles in 17 flights/120 hours and visited Nevada, Idaho, Montana, Wyoming, Utah and Arizona.